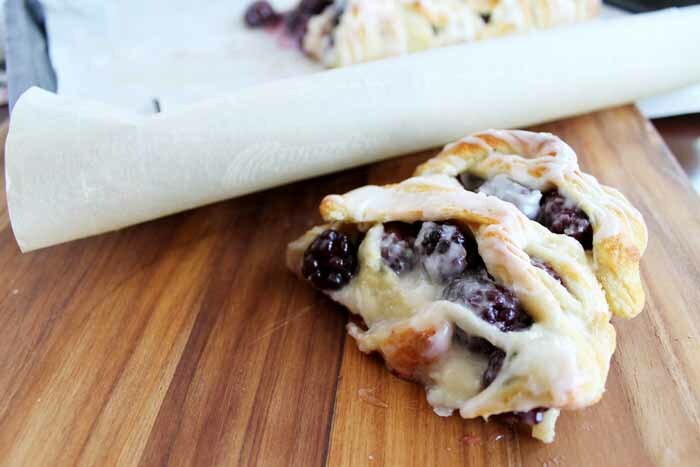 You are here: Home » recipes » Blackberry Cream Cheese Danish: Perfect for Breakfast! 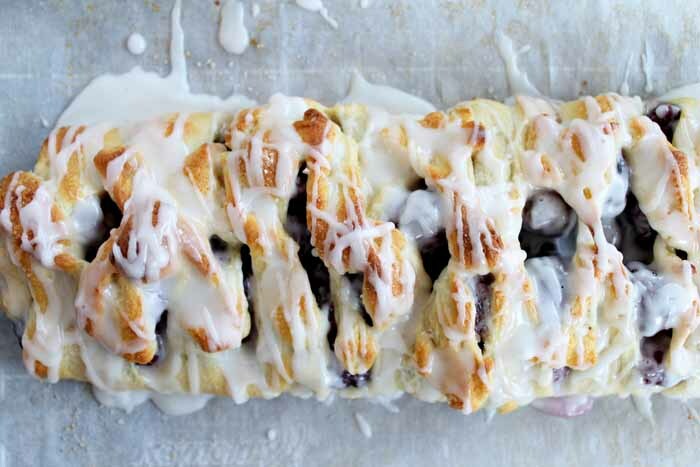 Blackberry Cream Cheese Danish: Perfect for Breakfast! Looking for a new breakfast recipe? Look no further that this blackberry cream cheese danish. It is easy to make and delicious. Don’t love blackberries? Substitute your favorite berries in the recipe for a new twist your family will love. Buy the ingredients for this fabulous recipe this week! Roll out your crescent rolls onto the parchment in one sheet. Close any perforations by pinching. Roll out with a rolling pin slightly. In a bowl, cream together cream cheese and 2 tbsp of the sugar. Spread the mixture down the center of the dough leaving 3 inches or so on either side. Use a knife to cut 1 inch strips down both sides. Rinse and drain your berries. Mix with 2 tbsp sugar and corn starch. Stir until berries are coated. Pour berries over cream cheese mixture in center of dough. Start braiding your strips around the mixture in the center. Sprinkle the top of the dough with 2 tbsp sugar. Bake at 375 for 14-16 minutes. While baking, mix together the powdered sugar with milk to create a glaze. Start with 1 tsp of milk and add as needed until you have a consistency that will drizzle. Once danish is done, remove from oven and drizzle with glaze. Cool 10 – 15 minutes before slicing to serve. 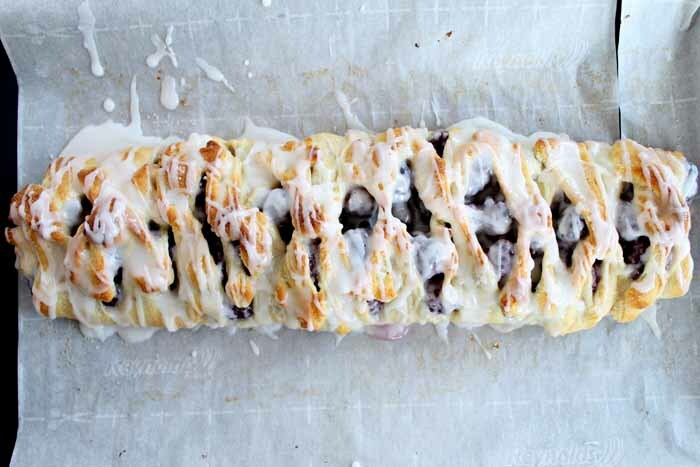 Your entire family will love this blackberry cream cheese danish. Make this as an extra special breakfast or just a snack that can be enjoyed anytime of the day. I personally love blackberries so that is what I am using in this recipe. Feel free to pick and choose berries to what your family loves. I don’t think you can go wrong with this cream cheese danish recipe! Roll out your crescent rolls onto the parchment in one sheet. Close any perforations by pinching. Roll out with a rolling pin slightly. In a bowl, cream together cream cheese and 2 tbsp of the sugar. Spread the mixture down the center of the dough leaving 3 inches or so on either side. Use a knife to cut 1 inch strips down both sides. Mix with 2 tbsp sugar and corn starch. Pour berries over cream cheese mixture in center of dough. Start braiding your strips around the mixture in the center. Sprinkle the top of the dough with 2 tbsp sugar. Bake at 375 for 14-16 minutes. While baking, mix together the powdered sugar with milk to create a glaze. Start with 1 tsp of milk and add as needed until you have a consistency that will drizzle. Cool 10 - 15 minutes before slicing to serve. 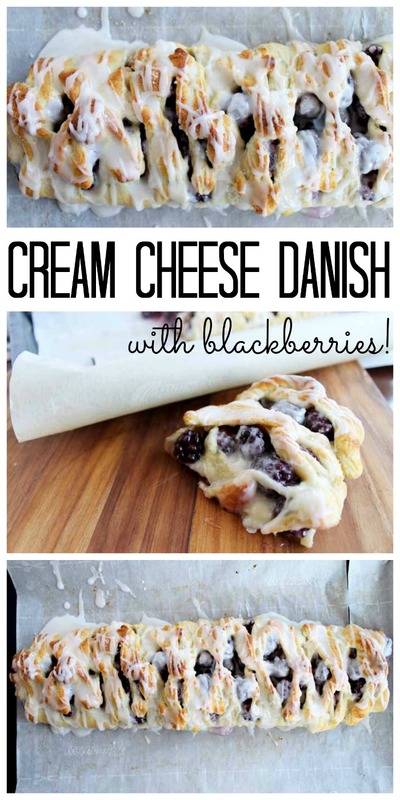 Love this cream cheese danish and want more breakfast recipes? Check out the links below for more ideas! next post: Simple Eye Makeup Remover – make these wipes at home!